Are you familiar with the show "Ancient Aliens?" This is not really related to my post but I thought I'd throw this bit of information in cause it's quite interesting. According to some scientists, the early gods that people used to worship and depict in their cave art could actually be aliens visiting...this explains the "super powers" they possessed and I think most of them were the inspiration for modern comic book artists to create these icons we now call "Super Heroes". So anyway, super heroes are super heroes and no matter what age you are, they will always stay awesome (which explains the long cues, comicon and box office hit after box office hit) and I guess timeless. So it's pretty cool that Shakey's now offers a Justice League Pizza Party. Pizza + Superman = sure hit with the kiddies and young at heart. And all packages automatically come with these lootbags + invitations. Talk about stress-free All you have to do, is give out the invitations and show up. 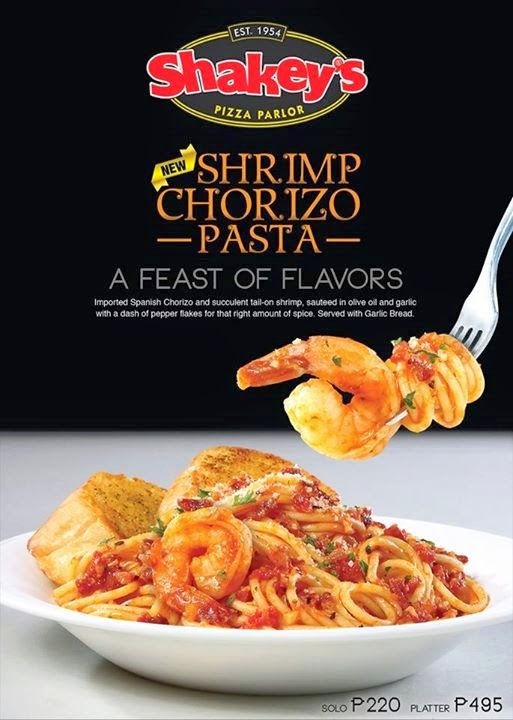 While we're on the topic, also make it a point to try out the new Shrimp Chorizo Pasta. Think olive oil, garlic, tail shrimp and the best Spanish Chorizo tossed with a rich and tangy marinara sauce on a bed of al dente pasta! WIN Mercury Drugstore GC's + a mystery gift!